Vineyards, large farms, and NASA all use near-infrared photography for assessing plant health, usually by mounting expensive sensors on airplanes and satellites. At Public Lab, we've developed a Do-It-Yourself way to take these kinds of photos, enabling us to monitor our environment through quantifiable data. Our technique uses a modified digital camera to capture near-infrared and blue light in the same image, but in different color channels. We then post-process the image (using Infragram.org) to attempt to infer how much it is photosynthesizing. This allows us to better understand and quantify how much of the available light plants are metabolizing into sugar via photosynthesis. You can do this yourself (as with all Public Lab tools) but there is also an Infragram DIY Filter Pack available in the Public Lab Store. Notable uses include this photograph of an unidentified plume of material in the Gowanus Canal (and writeup by TechPresident) and a variety of projects at a small farm in New Hampshire at the annual iFarm event. The Louisiana Universities Marine Consortium has also collaborated with Public Lab contributors to measure wetlands loss following the Deepwater Horizon oil disaster. Camera modification: We've worked on several different techniques, from dual camera systems to the current, single-camera technique. This involves removing the infrared-blocking filter from almost any digital camera, and adding a specific blue filter. This filters out the red light, and measures infrared light in its place using a piece of carefully chosen "NGB" or "infrablue" filter. Read more about the development of this technique here. You can also learn more about how digital camera image sensors detect colors at this great tutorial by Bigshot. 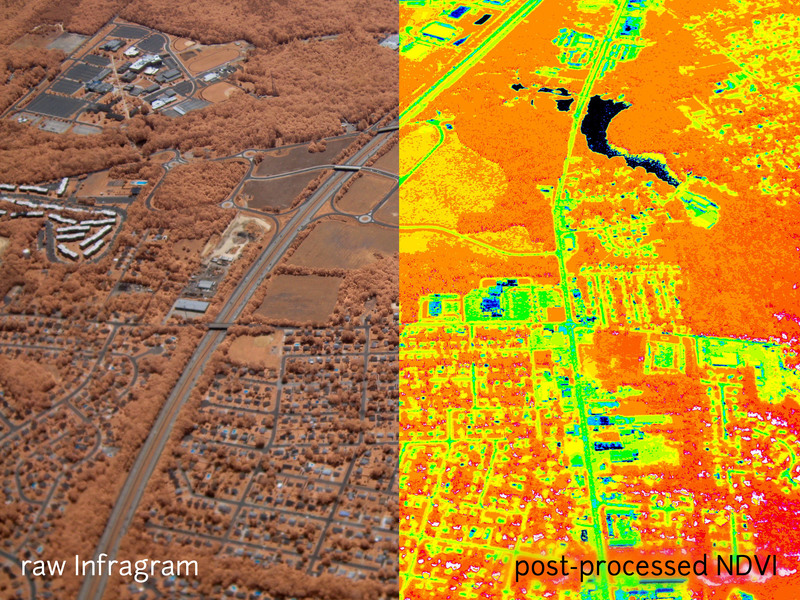 Post-processing: Once you take a multispectral photograph with a modified camera, you must post-process it, compositing the infrared and visible data to generate a new image which (if it works) displays healthy, photosynthetically active areas as bright regions. An in-depth article on the technique by Chris Fastie (albeit using red instead of blue for visible light) can be found here. History of the project: While we used to use a two-camera system, research by Chris Fastie and other Public Lab contributors have led to the use of a single camera which can image in both infrared and visible light simultaneously. The Infrablue filter is just a piece of carefully chosen theater gel which was examined using a DIY spectrometer. You can use this filter to turn most webcams or cheap point-and-shoots into an infrared/visible camera. The study of Earth's environment from space got its start in 1972 when the first Landsat satellite was launched. The multispectral scanner it carried, like the scanners on all subsequent Landsat satellites, recorded images with both visible and near infrared light. Remote sensing "scientists" quickly learned that by combining visible and infrared data, they could reveal critical information about the health of vegetation. For example, the normalized difference vegetation index (NDVI) highlights the difference between the red and infrared wavelengths that are reflected from vegetation. Because red light is used by plants for photosynthesis but infrared light is not, NDVI allows "scientists" to estimate the amount of healthy foliage in every satellite image. Thousands of "scientists", including landscape ecologists, global change biologists, and habitat specialists have relied on these valuable satellite-based NDVI images for decades. There are public sources of infrared photography for the US available through the Department of Agriculture -- NAIP and Vegscape -- but this imagery is not collected when, as often, or at useable scale for individuals who are managing small plots.